How much does it cost to travel to Nara? How much money will you need in Nara? ¥9,721 ($87) is the average daily price for traveling in Nara. The average price of food for one day is ¥3,459 ($31). The average price of a hotel for a couple is ¥11,032 ($99). Additional pricing is in the table below. These average travel prices have been collected from other travelers to help you plan your own travel budget. As Japan's first capital, Nara offers a world of tradition and culture second only to the city of Kyoto. 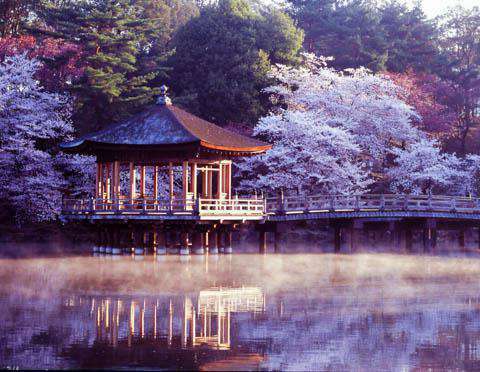 It is home to eight UNESCO World Heritage Sites, which are largely concentrated in the area of Nara Park. Here, it is also common to see many deer wandering freely amongst the temples and shrines. In Nara, Nara Park is the place where most of the city's sights are concentrated. Temples, shrines, and semi-wild deer span across a wide, pleasant space of greenery. The Daibutsu-den, which houses the second largest Buddha statue in Japan, is said to be the largest wooden building in the world and is a UNESCO World Heritage site. There is a giant front gate guarded by two fierce protectors, and there are many other giant statues and relics to be found on site. Kofuku-ji is a temple with a three-story and a five-story pagoda that can be viewed beautifully from Sarusawa Pond. Other temples and shrines of the park include Himuro Shrine surrounded by cherry trees, Ukimido built upon Sagiike Pond, Shin-Yakushi-ji with fierce warrior statues and a Buddha of healing, and Kasuga Taisha with a giant rack of sake barrels near the front gate and the fountain-statue of a giant buck. Nara National Museum has one of the world's best collections of Buddhist art and changing exhibitions, while some of the park's natural beauties can be viewed at the Kasuga-yama Hill Primeval Forest, Isui-en Garden, and the Yoshikien Garden. Downtown Nara is the area built up around the city's two main train stationsJR Nara Station and Kintetsu Nara Station. The two main streets, Sanjo-dori Street and Noborioji-dori Street, are where you will find most of Nara's hotels, shops, and restaurants. Noborioji-dori Street marks the north side of downtown and takes you up to Nara Park, where most of the historic sight-seeing can be done. Naramachi is the more traditional district of Nara where you will find some ryokan (Japanese-style inns), restaurants, cafés, and shops. Easy walking distance to Nara Park and the two train stations, Naramachi is a pleasant part of town to take a stroll and enjoy the peaceful side of a traditional city for an afternoon. With so much history and so many World Heritage Sites (both those mentioned above as well as others in the surrounding areas), sight-seeing can occupy most of a visit. Some worthwhile sights not yet mentioned include temple complexes like Yakushi-ji and Gango-ji as well as the Heijokyu Palace Site. One of the more renowned products of Nara is called kaki-no-hazushi, which is sushi (usually mackerel or salmon) wrapped in persimmon leaves and is used to make various foods from kudzu noodles to Japanese sweets. Somen are a type of thin wheat noodle also served in Nara, and can be either hot or cold. Another well-known culinary product is shika-senbei, a rice cracker sold around Nara Park, though it is mainly sold for the purpose of feeding the deer. The kaki-no-hazushi, mentioned earlier, is also popular take-out food, common with travelers passing through for a quick snack. As far as drinks go, yamato-cha is a locally-produced healthy green tea, and of course there is sake. Harushika brand is produced by one of the oldest existing sake breweries in Japan. Most restaurants are located in Downtown Nara or Naramachi, and range from local to international selections. Since Nara does not have its own airport, most visitors arrive via either Kansai International Airport or Osaka's Itami Airport (for domestic flights). From Kansai Airport, Airport Limousine buses run to the two Nara train stations every hour. By train from Kyoto Station, both the JR Nara Line and the private Kintetsu Kyoto Line will get you to Nara quickly. The trip can take 35-50 minutes depending on the train. The fastest train route from Osaka is to take the private Kintetsu Nara Line from Namba Station. As Nara is a major tourist attraction, there are a good number of buses that run between Nara and other locations throughout Japan, which are much cheaper than train fares. Major bus lines include JR Bus, Willer Express, and Nara Kotsu. Kasuga Shrine is situated in a pleasant forest and is one of the most interesting shrines in Japan. It's a Shinto shrine for the Fujiwara clan and has the gods that protect the city of Nara. The shrine has a lot of buildings with thousands of lanterns. There's also a pleasant garden. It's a nice shrine to wander through. Explore the grounds, and for 500 yen you can go inside. On occasion, you might be able to spot a deer from the forest roaming nearby the shrine. It's a very peaceful place and makes for a pleasant trip.